WASHINGTON -- The release of President Barack Obama's long-form birth certificate Wednesday took many observers by surprise. Many pundits questioned the timing and the political wisdom of the announcement, a sentiment White House Communications Director Dan Pfieffer seemed to confirm. He suggest to reporters at that morning's press briefing that it might have been in the president's "long-term political interests to allow this birther debate to dominate discussion in the Republican Party for months to come." But that may not have been the case. The most recent public polling on the issue shows that, overall, doubts about Obama's birth had been growing glacially at best, and not at all among independents. While the vast majority of Obama supporters and swing voters give the "birther" theories little credence, the controversy sharply divides Republicans. Moreover, even though release of Obama's long-form birth certificate is dramatic and unparalleled, it is unlikely to make a significant dent in any of these attitudes. The polling results support his argument: An ABC News/Washington Post poll a year ago found that 20 percent believed Obama was born outside the United States, but half of that group said their answer was “suspicion only” (10 percent) rather than a belief based on "solid evidence” (9 percent). Similarly, on the USA Today/Gallup poll conducted this past week, only 9 percent said that Obama was “definitely” born in another country, while 15 percent said the president was “probably” born elsewhere. These expressed beliefs are likely not all reflex and partisan cheerleading, as political scientist John Sides argues, but we should take care not to interpret the polling results too literally. The percentages who say they believe Obama was born elsewhere are probably a complex mix of people with actual beliefs and those with intense antipathy to Obama generally. The news coverage of the last 24 hours often cites the recent CBS News/New York Times poll that shows the belief that Obama was not born in the United States rising from 20 to 25 percent since last April. But compare the CBS/New York Times result to the other polls that asked similar questions over the 18 months. While these polls differ in their methodologies, they have reported a relatively consistent number of Americans or registered voters who hold the mistaken belief that Obama was born abroad (ranging from 20 to 27 percent). And the percentage that the CBS/Times poll reported last week, 25 percent, is still slightly lower than CNN reported last July (27 percent) and the same as PPP reported among registered voters two summers ago (25 percent). The ABC News/Washington Post poll conducted a year ago reported a lower percentage -- a full 1/5th of voters -- who believe Obama was foreign born, but the survey posed a much different question. It first asked respondents where Obama was born, without prompting for a specific answer, and then offered the more specific prompt (was Obama "born in the United States, or in another country?") only to those who were initially uncertain. Where is the evidence? Not in the CBS/New York Times poll, the one most frequently cited this week as showing an "uptick" in birtherism. As the table below shows, the percentage of independents who say Obama was born outside the U.S. shifted just a single percentage point over the past year, a change far too small to attain statistical significance. Similarly, the two PPP polls conducted a year apart show virtually no change among independents. What the CBS/Times poll does show is twelve point increase among Republicans over the past year (from 32 to 45 percent). One problem with focusing too closely on self-identified independents is that most "lean" to one of the two main parties and tend to vote reliably for that party. So the small share of independents with doubts about his citizenship may by mostly Republican leaners. If we set partisanship aside, however, and focus on support or opposition to President Obama, we see a clearer pattern. The most recent USA Today/Gallup poll included questions about both Obama's birth and about vote intentions for next year. Overall, 31 percent of registered voters say they will definitely vote for Obama, 23 percent say they might consider voting for Obama and 46 percent say they will definitely not for the President. Tabulating beliefs about Obama's birth by vote intention yields the striking contrast illustrated in the chart below: Obama supporters -- even those who say they "might consider" supporting Obama -- overwhelmingly reject the notion that he was born outside the United States, and only a tiny sliver (between 6 and 7 percent) say Obama was definitely or probably born in another country. 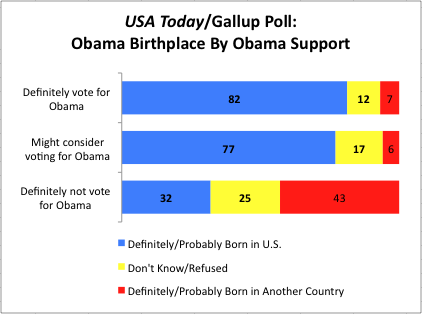 Yet among those who say they plan to vote against Obama, the birther issue is divisive. Nearly half (43 percent) of those planning to vote against Obama say he was definitely or probably born in another country, and only a third (32 percent) are willing to tell Gallup they believe Obama was born in the United States. [Thanks to Gallup Editor-in-Chief Frank Newport for sharing these tabulations with The Huffington Post]. Will the release of Obama's long form birth certificate this week change any of these attitudes? "The odds aren't good," says Brendan Nyhan, pointing to a series of experiments that he conducted with fellow political scientist Jason Reifler. Their experiments, Nyhan writes, "found that corrective information in news articles often fails to reduce misperceptions among the ideological or partisan group that is most vulnerable to the false belief" and, in some cases, made those misperceptions worse. Nyhan's expectation is consistent with an overnight national poll conducted on Wednesday by the firm SurveyUSA. Their poll (which combined automated calls to landlines and live interviewer calls to cell phones) finds 19 percent of adults, and 33 percent of Republicans, still believe Obama was definitely or probably born outside the United States. About half as many -- 10 percent of adults and 18 percent of Republicans -- tell SurveyUSA that they are "sure the birth certificate newly released by the White House is a forgery." With all of these findings in mind, let's return to the speculation about the political wisdom of the release of Obama's birth certificate. The survey data support the argument White House spokesman Pfieffer made: that a continuing debate on this issue among Republican candidates would work to Obama's advantage. This is especially true since potential swing voters in the Gallup poll -- the 23 percent still considering support for Obama -- overwhelmingly reject the birther myth. This data also helps to explain why Karl Rove and other Republican operatives have been urging GOP politicians to avoid discussing the birther issue. What polling snapshots cannot predict is whether this latest development will end the birther debate among the Republican candidates or keep it in the news. But if Nyhan and his colleagues are right, the false beliefs among a large portion of the Republican rank-and-file may persist, and the public discussion that Pfieffer says has been "really bad for the Republican Party" and "good for the President politically" may well continue.